I don't know the exact policy schools should adopt, but I do think there should be a KNOWN presence of defensive weapon/weapons in the building. Personally, I don't think that one security armed guard is the best answer. I'm thinking of our high school which is sprawling and huge and the expense of adding a full time position to every school in the nation. Lots of students could be shot while a security guard simply gets from one side of the building to the other, and even then, a shooter could easily position himself to pick one guard off. There's a narrow window of time that any defensive measure would be needed because the police would surely be on their way.... it's just those dire minutes before they arrive that's the issue. I am convinced that if the message that schools were efficiently staffed and equipped to defend the students in an emergency, then those precautions would almost never be needed. I don't think that placing a teacher in a position to hunt down a shooter is appropriate, but I have no problem with giving a teacher access to something other than her/his wits to stand between his students and someone armed to murder them. Shielding only against an intruder is not the whole answer. Columbine should teach us that. No matter what the policy should be, it won't address Mall shootings, or movie theater shootings, but I do think that because students are required to attend school during designated hours, we should and can stop it there. I really believe that adopting specific policies, specific to school settings, can make a real difference. I don't see any way to accomplish that without the known presence of guns within the building and a widespread belief that they will be used to protect the students from the moment their lives are threatened. IMO, we owe our children that assurance. Newtown killer Adam Lanza, who shot dead his mother, six other adults and 20 children, is badly missed by his brother. In a Facebook photo tribute, Ryan Lanza shared a smiling image of his younger brother, Adam (top photo), lounging in a long-sleeved shirt and a pullover tee. “I will miss you bro. I will always love you as long as I live,” Lanza posted. Lanza also posted a picture of his mother, Nancy, 52 (bottom photo). In it, she looks carefree as she sweeps blonde curls away from her eyes and laughs. “I miss you mom. I love you so much. You will be always in my heart,” he wrote. Adam Lanza sprayed bullets into his sleeping mother’s head before he massacred 20 children and six adults at Sandy Hook Elementary School. He killed himself as cops moved in. Ryan Lanza, who once attended Sandy Hook, grieved on Facebook for his brother’s youngest victims. In the wake of last week's Connecticut school shooting, many in the media and on Capitol Hill blamed one powerful lobby, the gun industry, and suggested banning assault weapons would lead to safer streets. Yet, there's another powerful lobby in Washington that few scrutinize, let alone criticize: Hollywood, though many argue the movie and video game industry also bears responsibility for incidents of adolescent violence. "Hollywood is very touchy about the idea of taking responsibility for the stuff it actually does," Parents Television Council's Dan Isett said. "What happened in Newtown is absolutely heartbreaking. It shouldn't take an instance like that to have 20 dead children that just went to school that morning, to have a real discussion about why this happened. To have a real discussion about what media does to our kids." Not unlike the NRA, lawmakers fear the Motion Picture Association of America and their political allies. Consider the clout and fundraising acumen of producer Harvey Weinstein, a major heavyweight in Democratic politics, along with actors George Clooney, Brad Pitt, and Leonardo DiCaprio, all of whom have acted in or produced violent films. I'm all for having someone carry a concealed weapon in schools. That person should be trained in carrying and using the weapon. I'm not sure it should be the principal. With all the schools in the United States not all principals will be willing to carry a weapon. Not all principals will be qualified to carry the weapon. I think it should be someone with a law enforcement/military background. I also believe there should be security cameras installed in every school. Maybe this person could monitor the school by monitoring the camera and also by walking around the outside of the school. I'm also wondering if every teacher should be carrying some type of walkie talkie to communicate with each other and report any suspicious activity. I'm for this also one of my best friends just became a principal here in CT she would do what ever she had to do to protect her kids in school..
Do you know their are kids in my grandson class that are afraid to go back to school . He said three kids are so scared they stayed home last week. We here in CT are going through a lot every other day now, their is a lock down in one of our schools. Mom definitely had her own stuff going on (and in support I want to say it was probably very difficult to live and deal with him and think about him having to leave and go to some type of institution or group home). Still, the guns......And now I hear he was on meds that say they are for schzophrenia - Uncle says he was on Fanapt, drug for schizophrenia, but newer (see drugs. com) - did he drink alcohol with his Mom (contraindicated for this med), did he not take it while she was away or did he have a reaction to it? Did he not have enough medication? Morton said techniques to recover data from severely damaged computers include dismantling and reassembling hard-drive pieces or using software owned by the Department of Defense. Sources have said the State Police are heading the shooting investigation. This was a comment someone made under an article I read. It's so true. The arriving officers encountered a shocking scene in Soto's classroom. Lanza had shot her, as well as special education teacher Anne Marie Murphy and six of Soto's 6- and 7-year old students. Seven of Soto's students were found huddled and unharmed in a classroom closet, apparently hidden by Soto when she heard shooting. The other students fled the classroom. 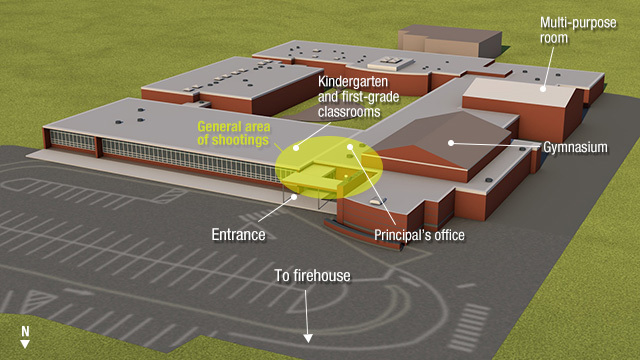 Based on initial statements from surviving children and the fact that Based on initial statements from surviving children and the fact that unfired bullets from Lanza's rifle were found on the ground, detectives suspect that some students were able to run to safety when Lanza stopped firing, probably for a short period of time, the officials said. The six children who escaped Lanza's rampage ran to a home a short distance from the school. Upon reaching the home, one of the boys told the owner that "we obeyed the rules, we stayed on the sidewalk," one of the officials said. In the aftermath of the Newtown school shooting parents are asking what drives kids to murder. In an excerpt from Far From the Tree, author Andrew Solomon explores how parents deal with criminal children—and speaks to Dylan Klebold’s parents about the aftermath of their son’s attack at Columbine. BEFORE THE NIGHTMARE:Victoria Soto and co-teacher Anne Marie Murphy join their first-grade students in an official class photo taken last fall. Those labeled were gunned down in the Dec. 14 massacre, while the others survived thanks to Soto’s heroism. “This is Victoria Soto’s class,” said Shannon Engel, the mother of slain 6-year-old Olivia Engel, holding back tears as she looked at the image. Olivia and her classmates are pictured smiling with their teacher and protector, Soto, 27, who was killed trying to protect the students from Adam Lanza. Fellow teacher Anne Marie Murphy, 52, also pictured, was slain as well. She was said to have been found with her arms around one of the slain children. With Lanza cutting his murderous path through Sandy Hook Elementary School in Newtown, Conn., Soto hid her students in a classroom closet and cabinets — and put herself between them and the killer. When Lanza entered the room, after killing 14 children in the classroom next door, she tried to steer him away by saying her students were in the auditorium. But a handful of students, including Olivia, tried to flee. Lanza shot them. In the photo are Soto’s other fallen students — Dylan Hockley, Allison Wyatt, Jesse Lewis, Avielle Richman, all 6 years old. But because of Soto’s heroic actions, most of her little students survived the horror. Thanks grace-land. I knew where the link was but I didn't want to post it because it was so sad to see the picture. You're welcome, San. I didn't know that this was the article that you were referring to. I believe that they were all angels and heroes that day. God bless them all. No father should have to spend Christmas Eve in a cemetery. But it was the only place Neil Heslin could be with his 6-year-old son, who was among the 20 youngsters slain in the Newtown, Conn., massacre. Heslin last saw his adored son, Jesse Lewis, Dec. 13, when the two went Christmas shopping. “He was rambling on about how this was going to be the best Christmas ever. We got into the whole meaning of Christmas, about giving and not receiving,” Heslin recalled. Jesse died a hero. Witnesses said he’d been leading other children to safety when he was gunned down by Adam Lanza. That is heartbreaking! I saw the interview with his dad after it happened & he had me bawling. Seems like thats all he had was that little angel. I hope he takes care of his daddy from heaven. Yes it is heartbreaking kcrn. I've seen another interview with him also. I hope he does take care of himself. In that interview he said his little boy had no fear and that's why he thinks he made a run for it. Very sad.